Heeft u een vraag voor Le Touché Hotel Pratunam? Gerenoveerd in 2013, garandeert het Le Touché Hotel Pratunam gasten een plezierig verblijf in Bangkok voor zaken of plezier. Het hotel ligt slechts 2 km van het stadscentrum: lokale bezienswaardigheden zijn dus snel te bereiken. Een baken van rust en ontspanning: dit hotel is het perfecte verblijf op steenworp afstand van bezienswaardigheden als Baiyoke II Toren, Phyathai 1 ziekenhuis, Indra Square. De faciliteiten en diensten, geboden door het Le Touché Hotel Pratunam, garanderen een plezierig verblijf voor gasten. Maak in het hotel gebruik van een selectie topklasse faciliteiten, zoals 24-uur roomservice, gratis wi-fi in alle kamers, 24-uur receptie, bagageopslag, wi-fi in openbare ruimtes. 48 kamers, verspreid over 11 verdiepingen, bieden een warme en plezierige atmosfeer met modern comfort zoals plasma tv, internet (draadloos), draadloos internet (gratis), rookvrije kamers, airconditioning. Of u nu van fitness houdt of gewoon lekker wilt ontspannen na een drukke dag, het kan allemaal in dit hotel dankzij faciliteiten als massage. 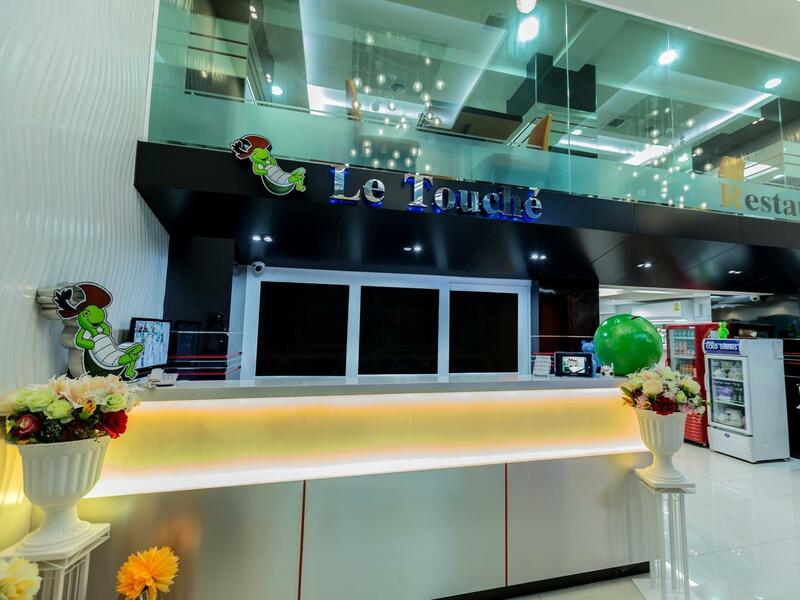 Het Le Touché Hotel Pratunam is een uitgelezen keuze als u een kwaliteitsaccommodatie zoekt in Bangkok. The hotel staff is very friendly and helpful. The location is good easy find massage, food and shopping. Room is clean just the sound insulation no so good. Facilities are complete just no have hair dry. Otherwise very good and nice for me. Will come back to stay. Location was good, surrounding with many massage centre, outside hotel was food street easy to get street food, but taxi and tut tut car hard to get in. Hotel staff was friendly. No kettle and hair dryer inside room, got tower and small fridge. You can get hot water at lobby. I stay 4 nights with child, will come back again. I have booked 2 room here . 1 room for wife and me,another 1 room for my friend. We are late check in about 11pm++ .when we request side by side room the staff told us all are full. They provide us 1 room at 4th floor for me and wife ,another room at 5th floor for my friend . The staff bring us to 4th floor 1st then bring my friend to her room at 5th floor unfortunately my friend's room door cant open due to some technical problems .then the staff bring my friend to 4th floor and managed to open a room but the aircond and tv not function.then again they changed the room and after tried to access a few rooms in that floor and finally get a room for my friend. The worst point is the staff told us there is no available room in same floor earlier but actually there is. Futhermore ,they provide us both room are without windows which is different with what we saw in agoda shown the room picture with window and curtain.the staf told us all rooms in that hotel no window.but actually there is.LIAR ! I have booked 2 room here for wife and me,another 1 room for my friend. We are late check in about 11pm++ .when we request both room at same floor but the staff told us all are full. They provide us 1 room at 4th floor for me and wife ,another room at 5th floor for my friend . The staff bring us to 4th floor 1st then bring my friend to her room at 5th floor unfortunately my friend's room door cant open due to technical problems .then the staff bring my friend to 4th floor and managed to open a room but the aircond and tv not function.then again they changed the room and after tried to access a few rooms in that floor and finally get a room for my friend. The worst point is the staff told us there is no available room in same floor earlier.Futhermore ,they provide us both room are without windows which is different with what we booked in agoda,shown the room picture with window and curtain.the staff told us all rooms in that hotel no window.but actually there is.LIAR! Good for short trips and value for money. Small room but minimum items (ie toiletries and towels) and facilities (safe box, cabinet, television, lobby WiFi) were provided. Room also looks pretty new. Only hotel guests and staffs have access to the room floors. The staffs were also very helpful and we could communicate in English with the receptionists. Location is within walking distance from Pratunam market and Platinum Fashion Mall. Situated near 7-Eleven and several food stores and massage stores. However, it may be quite hard for cars stop in front of the hotel. May have to walk (around 2 mins) to get to a wider road. 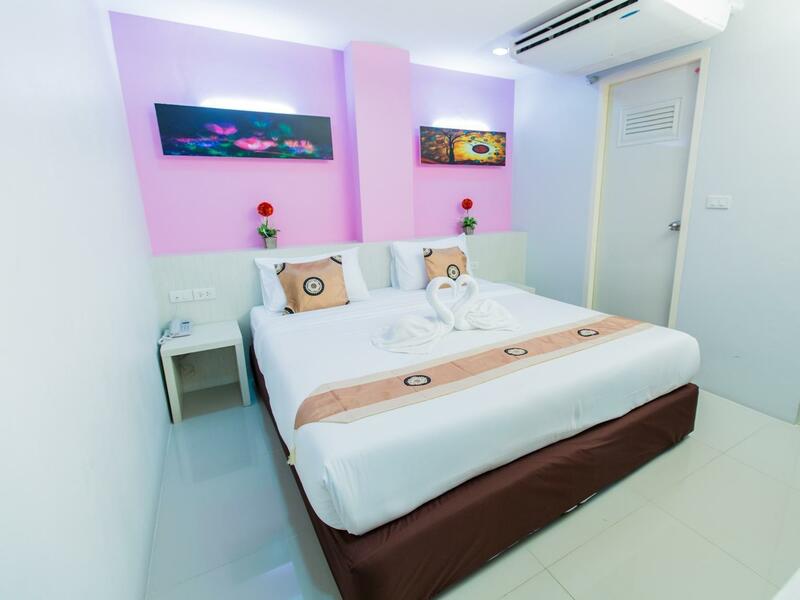 The hotel located at Pratunam market and it was just 20 mins walking distance to Platinum Mall & 27mins walking distance to Big C and Central World. The room was clean and bright and they provide daily cleaning service as well. The staff were friendly and always smile to the customers. 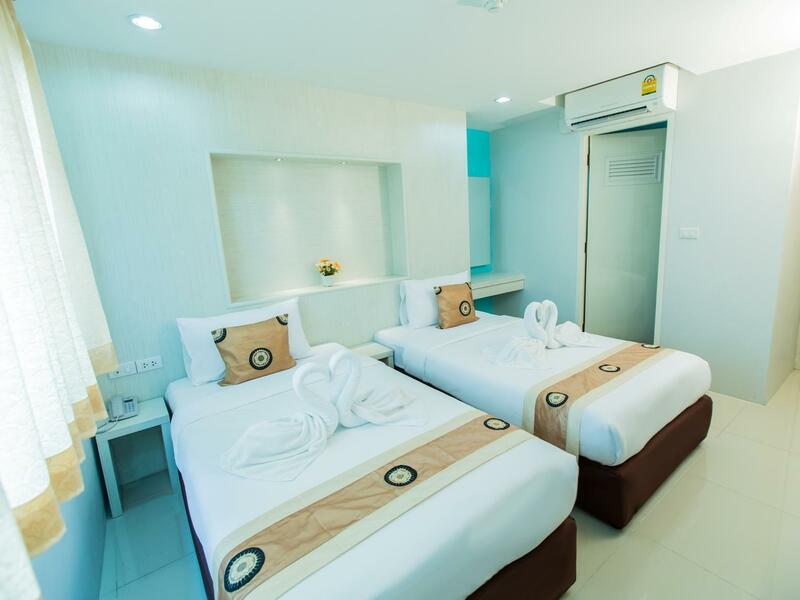 Hotel is just walking distance to Pratanum Mall as well as to BTS Station. Very convenient as just outside the hotel, there are massage centers as well as shopping area which is available both during the morning and night shopping area. Many street food stalls as well as small food shops. Hotel so far is good as they clean the room on daily basis on the 3 nights i was there. I stayed at the hotel for 3 consecutive nights for 3 of us. I can say it is good in overall and worth the money though I noted some cons. Pro: 1. The location are just in the middle of shopping area where I could find lots of staff to eat and to buy. 2. The room is clean enough. 3. The staff are friendly and helpful. 3. Plenty of electricity ports for charging my phones/ipads/cameras (Not less than 6 ports in the room, if I am not mistaken) Con: 1. Not enough facilities as expected such as toothbrush/paste, hair drier. 2. The hotel provide free wifi in each room, however it is not stable at all. In my room at the far end (Room No. 8804),for the whole 3 night the wifi signal was on and off all the time and too weak to use. I ended up with using internet from the sim card that I bought from the 7 Eleven convenience store for the 3 whole days. 3. I was not satisfied with the fact that I was asked to deposit for additional access card. One of us was too tired to go out at night and need the access card to connect the electricity in the room while two of us also need the access card to access the lift and enter the room once we came back at late night. Anyway, they were kind enough to offer help on the access. nearby is a food street, massage street, crowded of people, but very convenient to find foods to eat. and also shopping around pratunam street. staff is helpful, but need 20mins walk to Ratchadewi BTS. overall is good. Food was not a problem as the street was lined up with various choices which varied between morning and night. Regular amenities like massage and money changers were readily available near by. Shopping in the fashion market was about 7 mins walk away. 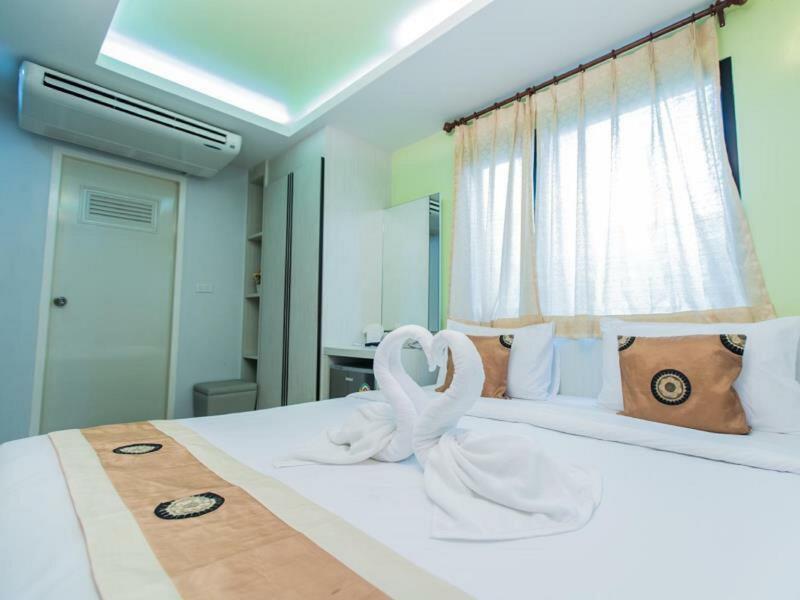 Location is good as it is close to Pratunam Market and Baiyoke Sky Hotel (buffet). However it is at least ten minutes from the train station so it took me some time to find the hotel when we first arrived from the train station. There are several 7-11 close by. Hotel is new and clean, staff is nice and helpful in giving directions for us. Upon arrival, we were welcomed with cold water to ease our thirst from the hot weather. They also helped carry our bags up the room. Using internet is a bit of a trouble here as you have to get the username and password daily from the reception as it expires at the end of the day. Overall, I'm pretty satisfied with my stay here. Hotel location is convenient, a lot of street food and massage at door step. We stay for 4 nights, their staff always friendly! Just the toilet a bit floating, but so far everything is good. Building is old and there are paints falling off the wall. Toilets very dirty and with missing tile, the bathing section will flood with water as the sewage is bad. They are helpful to “clean up” your room daily but the bedsheet and blankets are not new ones. You won’t have a peaceful sleep as the corridor have lots of movement and noise till early morning. There will also be random throwing of things and making a loud bang in the middle of the night. Booked 4 days and was leaving a day early, the hotel refused to refund me that balance one day even when I informed them that I was leaving way before the check out time, later on that day my friend came back to the room and the refused to let them in saying I checked out but I was told I still have a day !! Nice ppl but am not goi g back there again. Номер был снят на сутки только для того чтобы оставить на 4-5 часов наши вещи и вещи друзей и сходить в душ (еще четверо), долго не удавалось договориться, в итоге чуть ли не со скандалом удалось все же оставить сумки и по очереди по 2 человека зайти в номер на 5 минут, полотенец было всего 2. В отеле при этом других гостей не видели вообще, все происходило днем, мы никому не мешали. Персонал абсолютно не приветливый, фена не было. Room is small. no window. Electricity was shut down about 1 hr+ at midnight 1am for repairing something i guess. The stuff here mainly not Thailand stuff. Service can be improved. Good hotel and locates at the shopping area. Recommend for shoppers and night-life travelers. Helpful and friendly staff. The hotel locates in a small alley. Most of the time it is inaccessible by car. There are plenty of food stalls and shops around the area. Good for shopping and street foods. It was a comfortable stay, the rooms are small but it didn’t bother us that much, the staff is friendly and mostly don’t interact much as we are there to just shop and come home to sleep. The location is inside an alley but if you get used to the location, it has really good food and massage right outside your door step. It was good for the budget travellers looking to get in and get out!